Beaten rice is known in “Chira” in Bangladesh and North-Eastern States of India. Chira is although eaten in different ways, like raw, fried, with curd or mixing with some vegetables, here this recipe tells you how chira makes pulao. 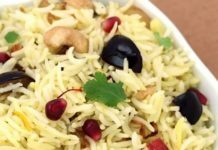 Beaten rice pulao recipe makes difference from the rice pulao both in the cooking process and in the taste. It may not be appropriate for the main meal but suits very well during snack or teatime. If you want to make a different and healthy food for your family and friends this recipe you can make. suits very well during snack or teatime. If you want to make a different and healthy food for your family and friends this recipe you can make. It has good nutritional food value, yet available at low cost. Chira is made from paddy before the paddy is tendered for the production of rice. It is a very common food in Bangladesh, India, and Nepal. Beaten rice is good for health. Sometimes this is used as a medicine. Especially for gastritis patient, it is good medicine for them. My niece always takes, soaked beaten rice with water or milk when she feels gastritis problem, and you know, she is a medical student. At my home beaten rice is mostly used as a medicine rather than a food. You can make it easy and offer a new kind of food dish to your friend. Just follow the process and you will have a wonderful and tasty pulao today. Soak beaten rice for 5 minutes. Cut all vegetables into the same size with a sharp knife. For the best sharp knife search online or shop. Wash beaten rice and drain out water. Keep aside. Boil mixed vegetables for 5 minutes with salt and drained water. Heat oil in a non-stick frying pan over medium heat. Beat the egg with one pinch salt and put it into a pan. Scramble the egg and take out off the dish. Put ghee into the nonstick saucepan and add chopped onion, green chili slices, ginger paste, garlic paste, cumin powder, hot spices powder, and salt. Stir it for 1 minute and add soya sauce. Add all vegetables and beaten rice to the spice mixture. Cover it for 1 minute. Stir it very well so that all ingredients are mixed very well. Turn off the burner. Take out the pulao in a serving dish. Now your different pulao made by beaten rice is ready to eat. Serve this beaten rice pulao with chicken curry or beef curry or eggplant chutney. Hope your guest or family members will like this different and healthy recipe. 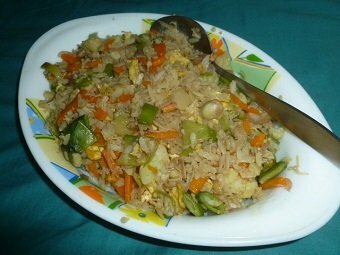 If you like my beaten rice pulao recipe please share this recipe with your family and friends.